LONDON – Designed specifically for audiences with profound and multiple learning disabilities (PMLD), Frozen Light theatre company presents The Isle of Brimsker. 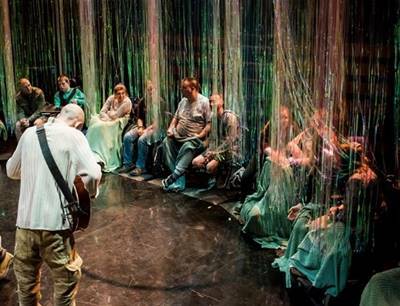 Embarking on an extended UK tour from now till June, The Isle of Brimsker gives these people with disabilities a chance to experience the magic of theatre with this multi-sensory story of discovery, friendship, isolation and how we react to change. Knowing that over 16,000 people in England live with PMLD, The Isle of Brimsker has been developed specifically for these audiences, structured to provide an accessible and theatrical environment that is performed within close proximity to small groups and with strong sensory and participation elements. For many of the audiences who watch this production, it will likely be their first time in a mainstream theatre venue. Performing to an intimately sized audience, the three-strong cast accompanies the audience from the foyer into the performance space, ensuring a smooth transition into the theatre environment. The play itself follows a lighthouse keeper who lives on a desolate outcrop surrounded by stormy seas. Duty bound to maintain the light that guides boats away from danger, she lives a solitary existence, until a runaway lands on the shore. With change on the horizon, together, they face the inevitable. Frozen Light launched in 2012 as a response to the fact that arts venues rarely cater for audiences with complex disabilities. In 2016 they presented the first ever Edinburgh Fringe show specifically made for audiences with PMLD, to sell out audiences. They returned to the Fringe in 2017 as part of the British Council Showcase.